London was fabulous, and I arrived in this new decade of my life with all the panache I’d hoped for! Since most shops in Hatton Garden are closed on Sundays, I made do with a visit to Louis Vuitton ;-) I spent more than I should have on a bag I’ve long admired… and a little something for Robert, then we walked around London, shopping, and talking about the day we’ll finally buy those one way tickets to England. We ended the day with dinner in Chinatown. If you’re ever in London, it’s really OK to skip Chinatown… there’s not much to see and even though we chose a well reviewed restaurant, the food was disappointing and of course, overpriced. 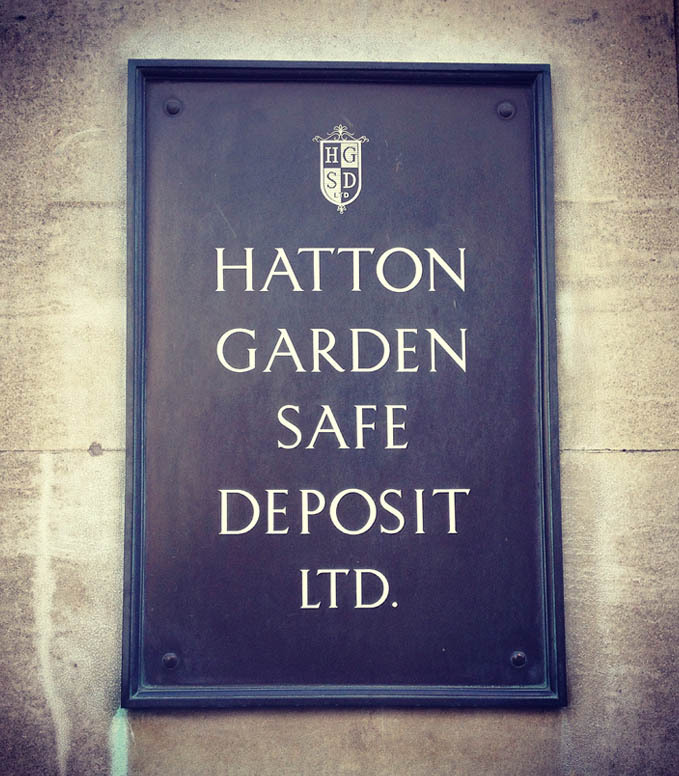 That evening brought us news of a jewel heist in Hatton Garden… serious Oceans 11 stuff! I was actually there to discuss a bespoke bracelet, but there was so much Art Deco goodness in the window, that I couldn’t resist having a closer look at a few pieces! If you’ve been reading my blog for awhile, you probably know that I name all of my jewelry. 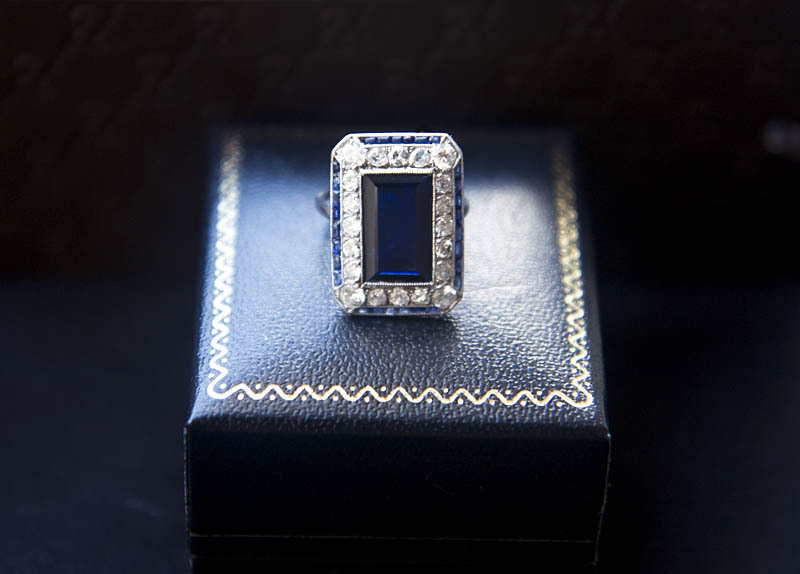 Zelda Fitzgerald was an iconic American flapper, and wife of my favorite American author, F. Scott Fitzgerald It’s the perfect Jazz Age name for such a beautiful Art Deco sapphire and diamond ring! 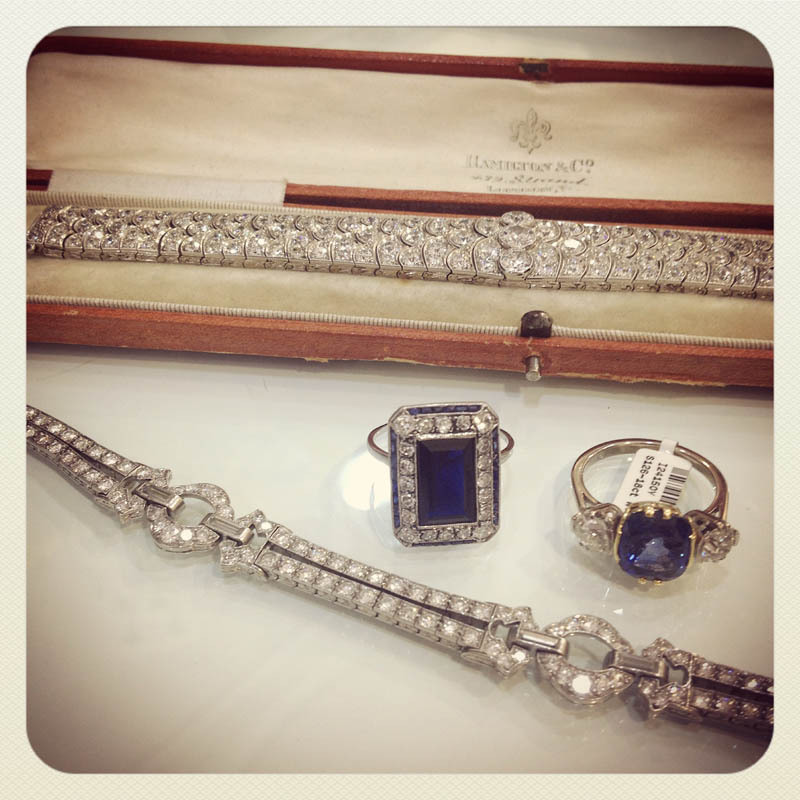 Zelda Fitzgerald is an English Art Deco sapphire and diamond ring from the 1920s. The center 3.50 carat natural, untreated sapphire is surrounded by twenty old cut diamonds, and calibré cut sapphires, all set in an intricate platinum basketwork setting. She used to belong to a woman with much bigger fingers than mine, so we went out to lunch while she was being resized. During this trip, we discovered the best ever (and oldest existing) vegetarian restaurant in London… a place on Soho Square called Govinda’s, it’s run by Hare Krishnas! How cool is that? I’m still figuring out how to wear Zelda… like Elizabeth Taylor and Little Edie, she’s a bit ostentatious. I’ve been wearing her interchangeably with Jackie Kennedy, but it’s hard work choosing Jackie over Zelda. If Zelda had been in the shop window the day I spied Jackie, Zelda would’ve been my engagement ring. Timing is everything with antiques, and living in Denmark doesn’t help with that. I just love imagining her on the hand of a fabulous flapper in 1920s London, maybe she even partied with Scott and Zelda, or hung out with Harry Selfridge. A very special piece for a very special birthday… start as you mean to go on, I bet this decade will be my best yet! Your ring is absolutely gorgeous. I like that you name all your jewelry as it tells a story and you have more of a connection with it. I am glad you weren’t at the Jeweler while the heist was happening and that your ring was safe and sound so that you may be the lucky wearer of it now. that sure is a lovely ring. i love the color + design, i know i won’t mind having one on my finger, too. also, you’ve got quite a clever way of naming your jewelry, now i need to go take a look at Jackie + Liz! What a beautiful ring. As a Virgo, the sapphire is my birthstone so I love all blue jewels. It is so interesting and unique that you name all of your jewelry. It’s so fun to have a passion like that. That sapphire and diamond ring is absolutely gorgeous. I have a similar sapphire and diamond ring, although bothe the sapphire and the diamond are considerably smaller. I love that you name all of your jewelry. That is so unique. Thanks… I’ll bet your ring is lovely! Is it vintage? Oh! That ring! You have amazing taste in jewelry as you do in everything else. Zelda is just perfect. Thanks for sharing and for the jewel heist information. Crazy people. 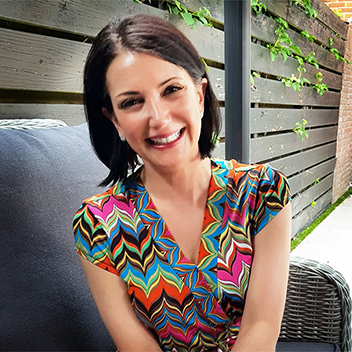 What a compliment… thank you! Wow what beauty in jewelry. It really reminds me that jewelry in most cases means is much more than just an “accessory”. It has so much more meaning, precious value and sentimental causes. Those photos really brought out the jewel, sparkle and color of the jewelry. I love sapphire, its also my birth stone! Thank you! I think of my jewelry as a wearable art collection. Antique pieces especially involve so much skill and craftsmanship that they’ve got to be seen as art. Wow, you’re one lucky lady to be surprised with such a gorgeous ring! It’s actually very similar to my engagement ring except for the fact that mine is oval shaped. I’ll be in London in June and think it’d be great to stroll through Hatton Garden and browse at all the beautiful jewellery. I really am, and I don’t take it for granted. Having grown up poor, I still sometimes have a difficult time accepting my good fortune, and find it hard to believe that I have so many beautiful things. If you should go to Hatton Garden, and what to see something different, have a look in in Farringdons’ window, they’re at 32b Greville Street, which intersects Hatton Garden. They always have beautiful, well-priced antique pieces. At the other end of the street is Berganza, which has a beautiful display of antique jewelry, but is grossly overpriced. It’s fun to look there, but don’t buy. That is such a lovely ring, very beautiful and definitely must have loving the colour too. I loved The Great Gatsby so I’ve always been fascinated with the author and his life! I think Zelda Fitzgerald was an interesting person, and I’d love to see those sparkles in person! What a beautiful collection. Paris in the 20s was THE place to be! Wow! That is a beautiful ring. It sounds as if it was a lovely birthday. As I read the bit about your husband mentioning the wedding ring and saying “happy birthday, darling” it made me smile so much. Art Deco pieces are so attractive – I love the style and presentation. The pieces you have highlighted in this post are extremely lovely. I like the bracelet the best though. And even though my favorite color is green, I think the blue in that ring is mesmerizing. Oh, I’m going back for that bracelet… if they don’t sell it in the meantime!